Safety at HMP The Verne in Dorset has "deteriorated significantly"
A prison has been criticised for weaknesses in its anti-bullying and suicide prevention policies. Safety at HMP The Verne in Dorset has "deteriorated significantly" since its last inspection, the Chief Inspector of Prisons said in a report on Wednesday. Anne Owers also said that the needs of foreign nationals at the jail on Portland were not being met. The report has been published following a surprise inspection visit to the training prison earlier this year. It does say that some progress had been made in increasing the "quantity and quality" of training provision. Work to prepare prisoners for release had also improved. Ms Owers said: "It is always disappointing when a prison which had previously been performing well is found to have deteriorated. "It is of particular concern when the dip in performance relates to safety. Staff and managers need to address this urgently." Phil Wheatley, director general of the Prison Service, said: "There is a renewed focus on improving prisoner safety, an issue we take very seriously. "The Prison Service also makes every effort to treat foreign national prisoners with decency and meet their diverse needs. 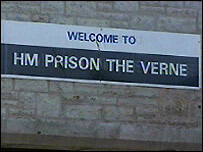 The Verne is a category C training prison for adult male prisoner.